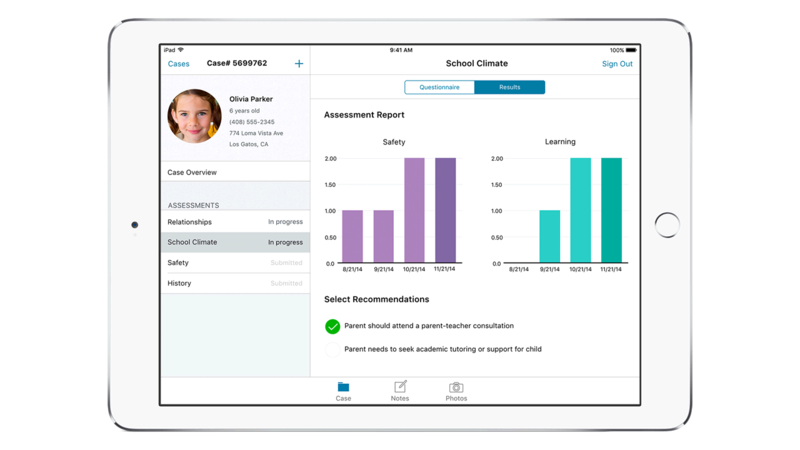 With one central place to access case history, perform assessments, and update data, IBM MobileFirst for iOS Case Advice offers remote social service workers resources while on the road. Visits are prioritized by urgency, with attached maps and directions tied to daily agendas. Case officers can collect and organize photos, attach documents, text or call relevant contacts, and perform assessments that provide guidelines and recommendations. All resources – colleagues, rule and regulation guidebooks, best practices – integrate with your daily task schedule. Critical alerts and calls to action are sent automatically, and recommended action steps and resources given with assessments, for better decision-making in the field. Case workers can add visual and audio evidence directly into case records for audit transparency. Automatic date/time stamping and more ensure compliance with courts. A unique support plan provides Apple phone help around the clock and IBM next-day service to handle any issues.